Visiting PhD student. BSc in Bioinformatics at Facultad de Ingeniería in Oro Verde (UNER, Argentina). 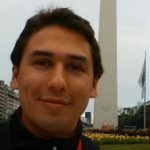 Currently, I am doing my PhD at IEGEBA (UBA-CONICET, Argentina), working in Comparative Genomics and Transcriptomics in Drosophila species. Two important projects of my thesis are the assembly and characterization of the genome of D. borborema, and the analyzis of the transcriptome of D. buzzatii in cold temperature conditions (diapause state). Next year I will collaborate in a project to develop a comparative genomic pipeline focusing on insects. From September to November 2016 I am visiting the González Lab to work on the presence of Transposable Elements (TEs) retaled to the stress generated by different feedings (alkaloids or not) in D. buzzatii and D. koepferae.